It's been a classic since it hit the big screen in the 80s, with memorable characters, a great theme tune and a timeless catchphrase. So, if you're looking for an online slot with more bonus features than you can shake a particle beam at, who you gonna call? That's right, it's the Ghostbusters slot from IGT. This video-powered homage to the movie features five reels with 30 paylines and in the true tradition of the supernatural, there are four mystery features that could pop up at any time. With a single spin starting from 50p going all the way up to £30, it's a game for any budget too. Play Ghostbusters for Real Money! 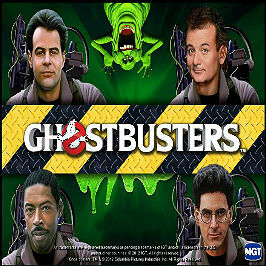 The film tells the story of four hapless scientists and their battle to save New York from all manner of spiritual troublemakers – including the lovable glutton of a ghost Slimer and the always amused Stay Puft Marshmallow Man. You'll find all the characters in this slot (with Slimer as the wild and Stay Puft as the bonus). As it's a video slot, the visuals are great. Each symbol is either a character or well-known piece of ghostbusting kit (like the trap or ECTO-1, the Ghostbusters' trusty transport). The display and information is clear and easy to read at the bottom of the screen, while Ghostbusters HQ forms the backdrop for the slots. 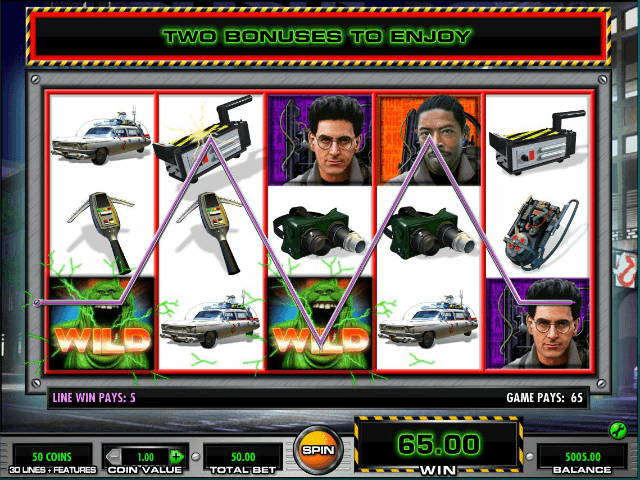 There are standard features you'd expect from any online slot: wilds (both reels and symbols), multipliers and even some amusing antics from Slimer himself if you win a Cash Award. 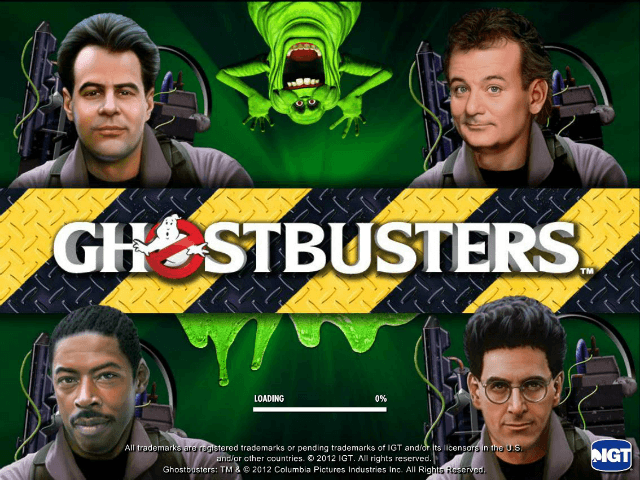 If you've played a few slots before, then you'll have no problem getting comfortable with Ghostbusters. 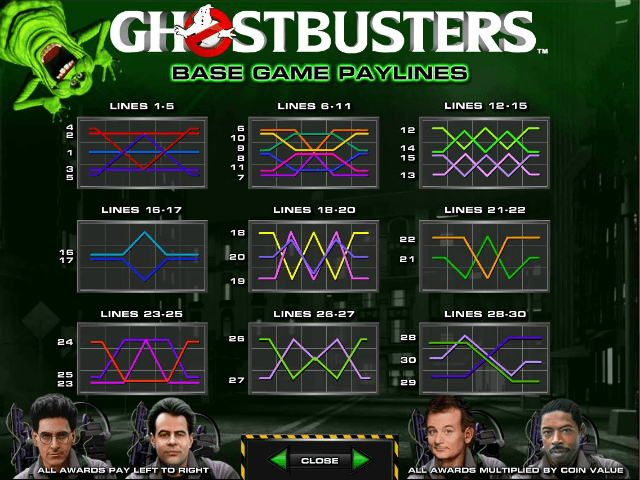 The wild and bonus symbols are also very obvious, so even if you're new to gaming, you'll have a good idea of which symbols are important (the classic Ghostbusters symbol for the bonus and Slimer for the wild). The mystery features can happen at random and while they're not as potentially lucrative as the main bonus features (which we'll look at in a moment), they can offer some great variety and fun to your game. They range from Slimer 'sliming' one to three reels and turning them wild, to multiplying your cash prize up to 1000x. The main features of this spooky online slot are the bonus modes. Ballroom Busters is triggered if you get two Ghostbusters symbols and one Slimer bonus symbol (different to the wild symbol). You can then use the fabled proton pack to fire proton beams at ghosts hiding in a ballroom – just like the scene from the movie. These ghosts can apply multipliers to your payout. The other feature is essentially a free spin mode. You can activate this one by matching two of the Ghostbusters symbols with a Stay Puft symbol. This gives you eight free spins and boosts the paylines to 40. The reels are changed for this mode too and you'll want to keep a special eye out for marshmallows. These can turn into locked wilds on a reel and can help you win big if you're lucky. If you're a fan of the film, you'll love this game simply because of the clips and presentation, though it's a solid choice for any online slot player thanks to its hefty payouts and slick theme. Share this Ghostbusters Review today! 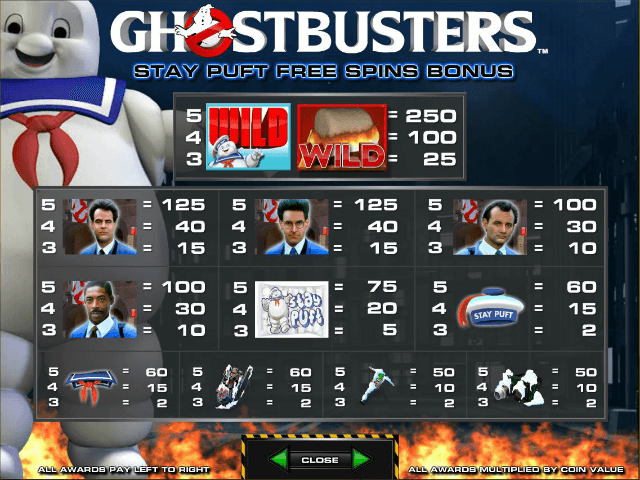 If you like Ghostbusters, you'll love these slot titles too!